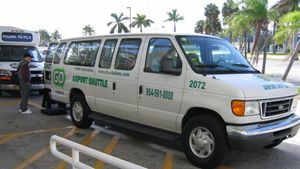 Go Airport Shuttle is the official transportation provider at FLL. They offer a shared van service to both cruise ports, the price for the shorter trip to Port Everglades is $12.65 and takes about 30 minutes, the cost per person to the Port of Miami a lot further south is $28.75 and takes around 60 minutes. It is possible to encounter delays on both routes depending on the time of the day or road works etc Allowing yourself another 30-45 minutes in addition to the traveling time above, would be prudent. For those people traveling alone or those, who simply don't want to take a taxi, a curbside kiosk, with an attendant on the lower level of each terminal "baggage claim area" can easily be found. Inside the lower terminals 1, 2 and 4 you will also see a Ground Transportation Information desk. At either a representative can assist you in obtaining a shared ride, to many different destinations including Florida's two Seaports. No need to book in advance, just show up and ride. I have never personally used Go Airport's shared shuttle service. For this reason I went on over to yelp to look at a few reviews and get a feel for what others were saying. 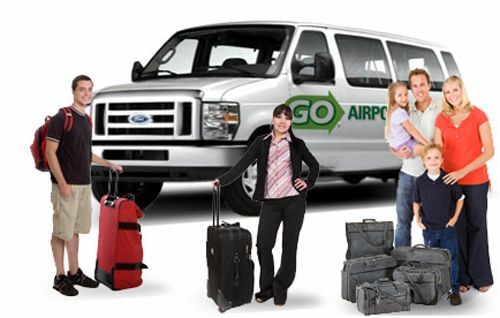 The reviews for all the different services Go Airport Shuttle offer in the Tri County area are all grouped together, so you have to read in between the lines to isolate reviews that are about just the shuttle service. Plenty of customers rave about the company and swear by it, a some do not. It seems like the main focus of the negative reviews is based on two things. Previously reserved pickups not arriving on time. Occasional comments about the driver's, lack of people skills and driving ability. If your arriving at the airport the first one is irrelevant as you can just jump in a van at the airport with no need to pre book. As to the other, we all have bad days! Like a lot of reviews online, most often it is just that small few that had a less than pleasant experience that take the time to leave a review, the thousands that had a normal type experience don't think to leave a review. Chances are you will have an uneventful trip that is nothing to rave or complain about. It is possible to use another shared van service, "you will need to book in advance on a website, then have them come pick you up at the airport." Super Shuttle "the official provider for MIA" is the only other company that also offers a service to both seaports from FLL. Prices are considerably more expensive than Go Airport Shuttle though. They do however offer services for those needing a wheelchair ramp or lift, an option I was not able to find on Go Airport Shuttles website. If you are flying into FLL it seems like your choices are seriously limited when it comes to easily finding a shuttle service. There are a few websites offering a service if you search for "FLL shuttle to Port Everglades Shuttle" in Google. I have visited most of the websites and none appear to be offering anything of value, either it's a broker selling you a ticket $20.00 above the price of Go Airport Shuttles fixed rate of $12.65 There are a few companies catering to large groups of 10 or more, these do work out cheaper if you are traveling in a very large group. It is the cheapest option for couples and single's traveling to the Port of Miami. Cheaper options are available except, as mentioned above. Possibility of delays in traffic. With at least ten different taxi companies licensed to operate from the airport you will not have any problems finding a taxi upon your arrival, regardless of the time of day. Personally I have never exited the airport and not seen a long line of taxis waiting. 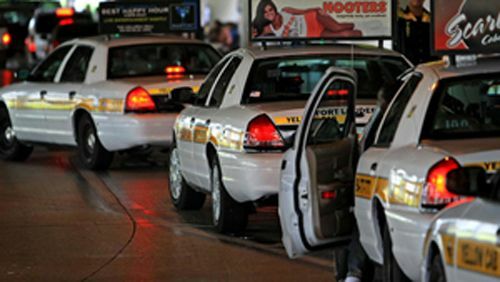 Yellow Cab Broward is the largest of them all and the most popular in and around Fort Lauderdale. Trips starting at FLL or departing from Port Everglades all have a minimum fare of $10.00 For those originating from the airport there is also an additional $3.00 This really dose not change anything in the grand scheme of things, for those departing on a cruise, as the cost of a four mile trip would still be $12.00 in and around town. Fares to Port Everglades normally run around $15.00 which is very competitive when one considers it costs $12.50 per person for a shared van. The short 4 mile journey normally takes about 30 minutes or less. Allowing yourself an hour or more is extremely prudent, and should give you a very safe window, with time to board your vessel without rushing. Simple no fuss and cheap solution for anyone wanting to get quickly to Port Everglades. If you are traveling somewhere in Broward County there is nothing negative. For longer trips to Dade and the Port of Miami there is the possibility of serious delays, and it is expensive at $80.00 if you are traveling alone or as a couple. Both companies do not charge extra for this service,"prices are the same as normal taxi fares" they do ask that you telephone in advance, using the telephone numbers above to schedule a pickup. Pros and Cons are basically the same, "re price and time" as stated above for regular taxis. Just allow for a little extra time for the driver to get to you. Go Airport also owns the concessionary rights at FLL when it comes to limos and town cars. Reviews from passengers using their town car service are significantly better than those received for the shared van service. Prices are for the most part equal to or better than their competitors offering similar services in the Tri County area. As an example Go Airport charge a flat rate of $92.00 compared to Supper Shuttle the official provider at MIA who charge $138.00 for the South bound route. 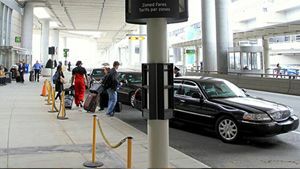 Many other different limo companies offer services to and from the airport. It is hard to pick out one and state "this would be a good choice, mainly because Go Airport is based at the airport, they offer competitive rates and you do not need to book in advance to hire one of their cars. Public Transportation in and around the airport is available, what's weird though, is there is no traditional type, transportation that connects directly with the airport. 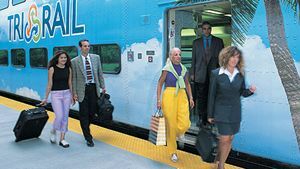 You would first need to take a free shuttle "provided by TRI Rail" to connect with the main public transportation network in Broward County, even then the best that is on offer is a connection that runs directly to Daina Beach train station 7 miles further south. It is also worth mentioning that, one cannot easily just walk out of the airport and jump on a bus, as it backs directly on to I95 with no place to walk safely. Using public transportation to get to Port Everglades simply does not make sense. For the longer journey south to the Port of Miami it is a cheap and viable option, which is covered in detail here. It is posible to take the Sun Trolley "uniquely on weekends" provided by Browad Transportation services from the airport to downtown Fort Lauderdale "no baggage is allowed on the trolley so it is not an option for getting to your cruise ship, as most people taking a cruise have suitcases or the likes" It's main purpose is to allow passengers with a long wait at the airport a chance to visit down town Fort Lauderdale. © 2006 - 2019 www.fortlauderdaletomiami.com all rights reserved.